Follow up : Silver on edge !!! You are here: Home / Commodities / Follow up : Silver on edge !!! 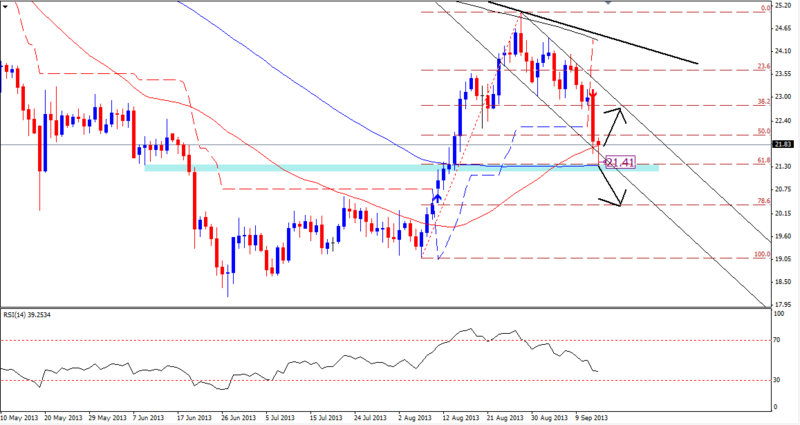 Silver (13.09.2013) traded lower & reach to the mention target area. Now silver is trading around $21.65 & as we can see on charts, this area represent a combination of many supports. The lower tradeline of current descending channel with 61.8% feb correction level as well as a parallel support is also there. Thus this area may act as a level of some profit booking or may be a reversal point. Looking at the candle stick pattern , we are unable to identify any positive move which actually stop us from entering into fresh trade. A break below may initiate panic selling. SO where is silver going now ????? Based on above studies, we will prefer to stay neutral & look for an better entry level & direction.